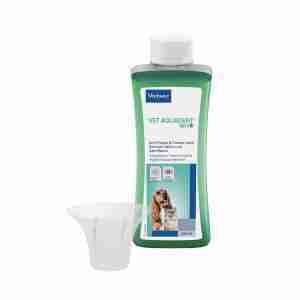 Vet Aquadent can be mixed with your pet’s water, helping to fight off tartar and plaque while making their breath nice and fresh. It’s easy to forget that oral health is important for your pets too. Having clean teeth and gums not only makes them healthier, it can protect them from infections too. Plaque and tartar, if left to build up, can cause bacteria to move down into your pet’s tummy. This could make them get ill, so it’s much better to avoid the risk by helping them keep their mouths nice and clean. just add to your pet's water. Aquadent was developed by vets to address bad breath and oral health issues in cats and dogs. The active ingredient, xylitol, stops calcium from fixing on teeth and, along with chlorhexidine, the formula can prevent the formation of plaque and tartar. This helps to keep your cat or dog's teeth healthy, as well as keeping their breath fresh. The special ingredients in Aquadent stop plaque and tartar from sticking to your pet’s teeth, which helps keep their mouth clean and healthy. It also fights the bacteria that leads to bad breath, so you won’t have to hold your nose when they’re sitting on your lap anymore! In general, the recommended dose is six millilitres of formula per 250 millilitres of water, but always ask your vet if you’re not sure. Toby drinks his water normally. Doesn’t seem to notice anything different. Too early to say if it is helping keep his teeth white, but it is an easy method to try. Excellent. Dogs were a bit wary at first but now they are okay with it. Breaths a lot nicer too. I have a cat who, unfortunately, has an on going plaque problem. However, the problem is kept well under control with the daily addition of Aquadent to his water. It is the only product that works. Very good product, both our cats and out dog enjoy the taste as they all spend longer at the water bowl which is proof that they approve of the addition to their water supply, very highly recommended. I couldn't really see how this would work efficiently but my goodness it does, it is amazing and the fur babies are very happy to drink their water with this solution added.